Sydney has been a little hot lately, quite a heatwave we are experiencing. So when planning my menu I try to think simple, easy cooking. And as for dessert I like them to be cold and light. 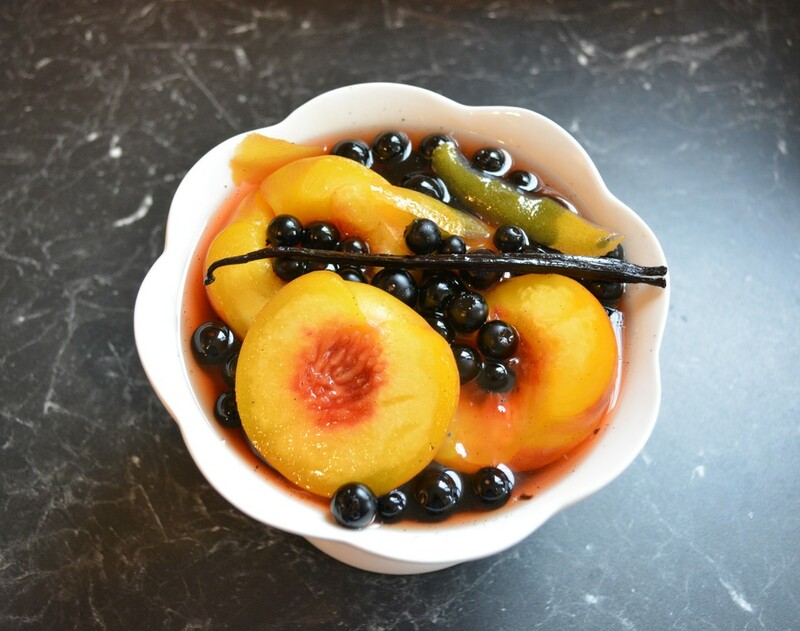 I first made these caramel poached peaches years ago and then forgot about them (easily done when you have as many cookbooks, magazines and recipe cutouts as I have). But my daughter reminded me of them and asked if I could make them again. I do love when my kids request things they loved from the past, the fact that they have memory of something they ate is quite special for me. 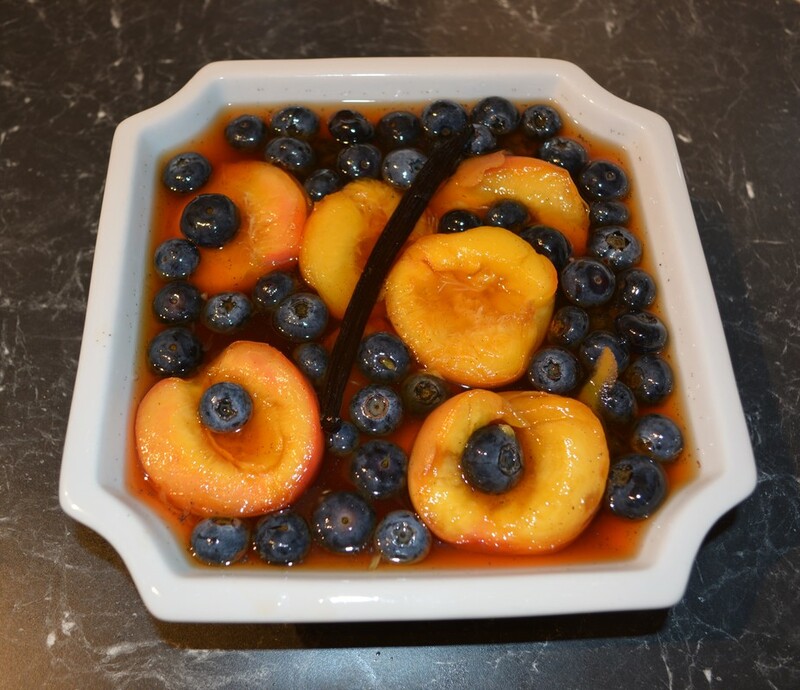 This is quite simple to make and is perfect in summer, as it is hot and peaches and blueberries are at their cheapest. I like to make them in the morning and refrigerate them until needed. You can make it the day before, however the peaches change colour, they get stained by the blueberries and although taste great, they don't look as great. So it is up to you when you make it. I love it served over vanilla ice cream, it is a perfect summer dessert this way. I have doubled the recipe and it works perfectly, you just need a pot large enough to fit all the peaches in. The peaches need to be just ripe, slightly harder is better than over ripe peaches, so choose peaches that are not too soft. This is a dessert my family gets excited over, give it a try and see if yours does to. Place sugar into a heavy based saucepan, place over a medium heat. Watch the sugar, it will start to caramelise. Swirl the pan as the sugar dissolves and turns a golden colour, but do not stir. When most of the sugar has caramelised, carefully pour in 500ml of just boiled water, and stir with a long handled spoon. It will spit, so take care. The sugar will become firm, but keep heating and stirring and it will dissolve again. Add the lemon zest strips and vanilla seeds and pod. Simmer for 5 minutes. Score the peaches in half and twist to seperate. Remove the stones. Place a peach half onto your long spoon and slip it into the syrup in a single layer, repeat with all peach halves. Return the caramel to a gentle simmer and turn down the heat until it barely simmers. Cook for 5 minutes or until the peach flesh feels tender when pierced. Remove the pan from the heat, mix in the lemon juice and blueberries. Allow to cool for 30 minutes. Once cool place in a large bowl or into sterilised jars and refrigerate for at least 2 hours to chill. ​Serve with vanilla ice cream.